Félicien David is a name that, in more than 20 years of listening to classical music, I had never knowingly heard before about a month ago. But in the mid-19th century David was famous for his works on exotic subjects: after a trip to Egypt he wrote 22 Melodies orientales (1836) for piano and the "symphonic ode" Le Désert (1844); later he wrote operas set during a slave revolt in Brazil and during the eruption of Mt. Vesuvius that destroyed Herculaneum. No source I've found discusses why David turned next to the essentially comic plot of Thomas Moore's Lalla Rookh. Although the Indian setting must have appealed to David's love of the picturesque, the opera may have been a commission from the Opéra Comique. Whatever the inspiration, it was a happy one: from the first performance in 1862, David's Lalla-Roukh was a huge hit. Demand was so great that special trains were run to bring opera fans to Paris from outlying regions. Lalla-Roukh's popularity remained undiminished for the rest of the 19th century; over the next three decades it received hundreds of performances in Paris and across Europe. At the end of the 19th century, though, the eclipse of David and his operas was sudden and almost complete. Lalla-Roukh dropped out of the repertory, and for over a hundred years only a few arias and duets from the work were occasionally recorded or performed in concert. But in January 2013 Opera Lafayette, under conductor and artistic director Ryan Brown, staged in Washington D.C. and New York City what were apparently the first performances of the opera since 1898. Brown's troupe was able to sandwich recording sessions in between those two performances, and in March of this year the world premiere recording of Lalla-Roukh was released on Naxos Records. Listening to the opera today, it's difficult to understand why a work so full of melody was so thoroughly forgotten. Perhaps it's because the opera is more atmospheric than dramatic. The 1890s saw the rise of the lurid plots of verismo and the creation of Puccini's first great tragedies. The delicacy and charm of Lalla Roukh—an opera which ends with two pairs of lovers united, and in which no one is murdered, commits suicide, goes mad, or is left in despair—must have become unfashionable. 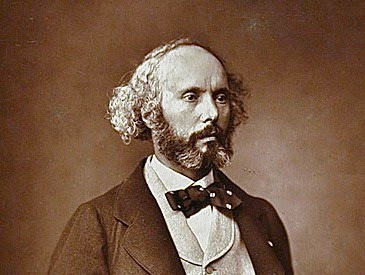 As with many operas based on literary sources, substantial changes were made in translating Moore's story to the stage. 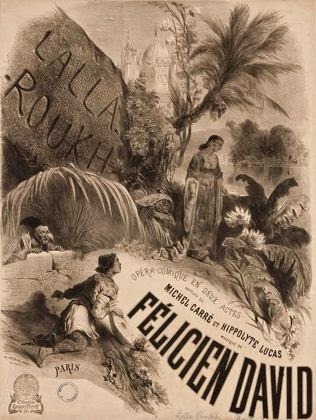 David's librettists, Michel Carré and Hippolyte Lucas, jettisoned everything in the book but the central love story: while travelling from Dehli to meet for the first time the King of Samarkand, to whom her marriage has been arranged, the princess Lalla-Roukh encounters a handsome young troubadour and falls in love with him. In a departure from Moore's original, in which the princess resigns herself to going through with the arranged marriage, in Carré and Lucas's version she vows to refuse the King and find her way back to the troubadour. Little does she suspect that the troubadour and the King are one and the same. In addition to changing some of the details of the story, Carré and Lucas also changed the names of many of the characters: the troubadour Feramorz became Noureddin; Lalla Rookh's chamberlain Fadladeen became the King's emissary Baskir; and three comic servants, Bakbara, Kaboul, and Lalla-Roukh's lady-in-waiting Mirza, were added. But the changes do no harm to Moore's story, and instead compress and intensify the action. On the evidence of the Naxos recording and videos about the production posted on YouTube, the Opera Lafayette production looks and sounds as though it was delightful. The cast, although largely unknown to me, is excellent. In addition to directing the stage action, bass-baritone Bernard Deletré—whom we've seen previously in Purcell's Fairy Queen with William Christie and Les Arts Florissants, and in the Mark Morris production of Rameau's Platée—took the comic role of Baskir. 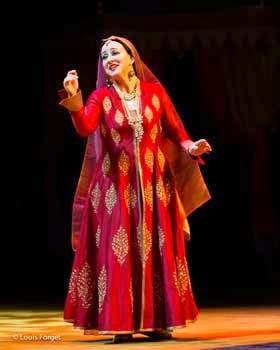 Canadian soprano Marianne Fiset is a lovely-voiced Lalla-Roukh. Emiliano Gonzalez Toro portrayed a Noureddin who is more passionate, perhaps, than lyrical, while Nathalie Paulin's rich mezzo as Mirza ensured that it's the dilemmas of the women that are the opera's dramatic focus—as they should be. 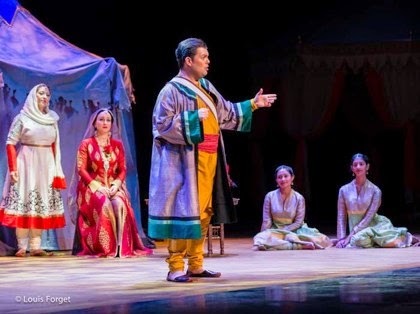 Staging Lalla-Roukh raises questions of cultural appropriation on many levels, but to their credit Brown and Deletré neither tried to recreate the style of 19th-century French Orientalism, nor treated David's work ironically or as camp. Taking the first approach would do violence to 21st-century sensitivities, while the second would do violence to the work. Instead, they tried to bring to the opera a modern, cross-cultural sensibility. 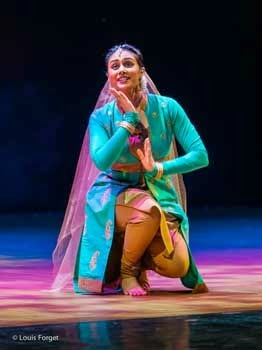 To stage the dances of the bayadères, Brown brought in classically-trained Indian-American choreographer Anuradha Nehru and her company Kalanidhi Dance; the costumes were commissioned from Indian fashion designer Poonam Bhagat. In reviving and recording this forgotten gem, Opera Lafayette has outshone opera companies with budgets many times as large. If you enjoy the sound-world of Offenbach's Tales of Hoffman, Bizet's Pearl Fishers or Delibes' Lakmé, you'll find Lalla-Roukh to be a fresh new discovery with some welcome familiarities. You can listen to brief excerpts from Act I on the Opera Lafayette website. Next time: The 1958 Bollywood movie Lala Rookh. Jane Austen and Cecilia: A personal connection?